Daniel Clive Wheldon was an icon among racers in the Izod IndyCar series. Not just for the talent he possessed, but for the man he was off the track as well. 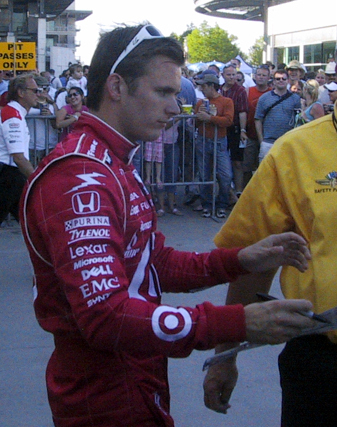 Wheldon adopted the city of St. Petersburg as his hometown just shortly after winning the 2005 inaugural running of the Honda Grand Prix on the city’s streets. Wheldon wasn’t just a racer, he had a family. 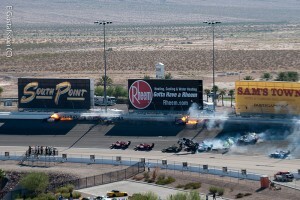 One he loved and cherished up until his final seconds in Sunday’s Indy 300 at Las Vegas Motor Speedway. His wife Susie Wheldon, just three years into their marriage had given birth to a newborn baby boy just months earlier. Along with Sebastian, was Oliver. Three people, one family torn to pieces. His family was just one cherished moment of his short life defined by success, love for the sport of racing and the fans that surrounded him throughout his career. But he had much more than that and even on Sunday, Indy racing’s “Black Sunday”, his heart far exceeded the talent. If it weren’t for his fans, he might have never entered the race at Vegas. Wheldon was racing for a $5 million bonus from the league, a challenge given to him and any other non-traditional Indy racer for the season (Wheldon had been dealing with financial difficulties and couldn’t find a ride with the exception of Indianapolis). Wheldon decided to accept the challenge and split his earnings with a fan, if he were win that is. The field of 34 drivers speeding around the track at nearly 225 miles an hour, proved to be too much, too soon. Only 12 laps into the event, chaos broke out. A 15 car wreck in front of Wheldon. The on-board camera captured the seconds before his life was ended. His front wheel clipped the rear of Paul Tracy and he went airborne. 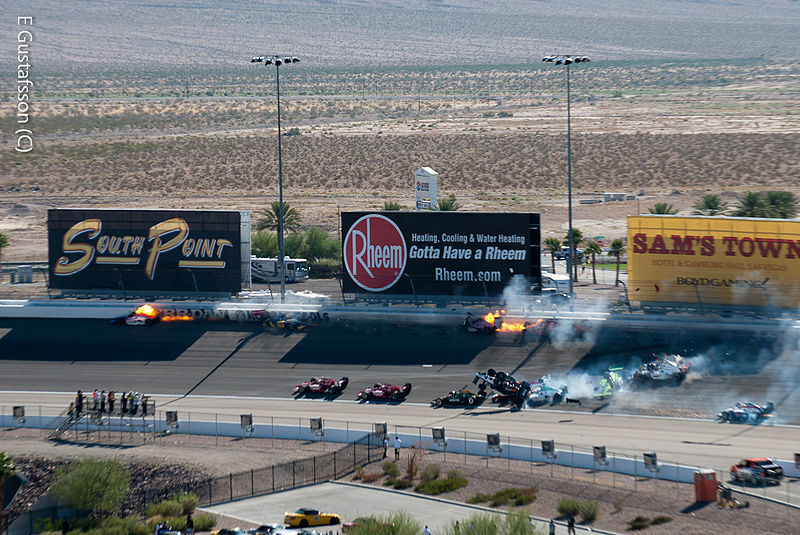 For 200 feet, Wheldon’s Honda whipped through the air before colliding with the catch-fence above the wall causing the car to burst into flames and desintrigate upon impact. Wheldon was airlifted to a local hospital where two hours later, IndyCar made the announcement he had died due to “unsurvivable injuries”. In what is probably the single greatest thing I have ever witnessed in auto racing, all drivers returned to the track, lined up in rows of three and took five laps around the track. With the songs “Danny Boy” and “Amazing Grace” blaring over the PA system, fans in attendance sobbed. As did three-time champion Dario Franchitti, who instead of celebrate with tears of joy, flooded his heart with tears of sadness. His wife handing him tissues as he tried to come to terms with what had just happened. There was nothing. Just sadness. It may take years for racing and our community to get over the loss of one of its greatest. Dan Wheldon didn’t just win two Indianapolis 500’s, the 24 Hours of Daytona and a championship. He won over the hearts of his new hometown. He was a champion. On the track and off the track. What disturbs me is not the incident but the lack of concern from people in the Bay area. Since he’s from St. Petersburg, why does no one seem to care. If it were a college football player with an over infalted ego they’d wouldn’t stop talking about it.